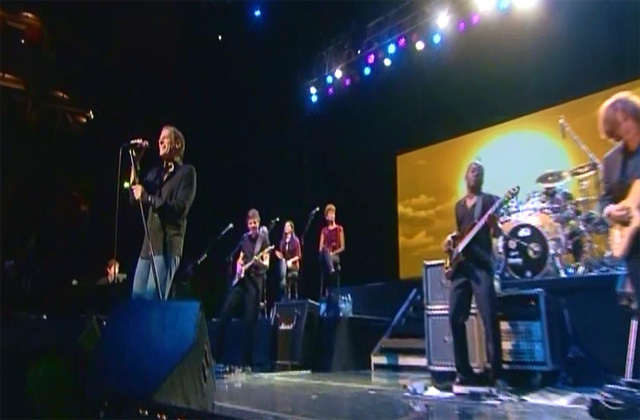 Crooner Michael Bolton’s October 2009 concert at London’s Royal Albert Hall features all his usual favorites as well as a some new ones from his One World One Love album. Bolton starts out strong with his own staple “Soul Provider,” but throughout the almost two-hour disc, he not only delivers numerous songs from his own 25-year career, Bolton also covers such artists as Otis Redding (“Sittin’ On the Dock of the Bay”), Ray Charles (“Georgia On My Mind”) and Percy Sledge (“When a Man Loves a Woman”). Backed up by his band and an all-female brass section, Bolton’s sultry voice curls around the lyrics beautifully, especially on “Murder My Heart,” a song he co-wrote with Lady Gaga that’s from One World One Love. He performs in front of a backdrop of shifting images, such as a setting sun. And he and his three pretty backup singers go through a series of costume changes. Bolton starts out a little more formal, topping nice blue jeans with a brown shirt and jacket and ending more relaxed in a grey T-shirt and light jeans with rips on the knees. It’s as though he becomes close friends with his audience over the course of the performance. Also included on the DVD and Blu-ray is an additional performance of “Nessun Dorma,” an interview with Bolton, the “Countdown” documentary and a seven-minute featurette showing behind-the-scenes footage of Bolton and his team getting ready for the Royal Albert Hall show. Bolton toured the U.S. this year, and the Royal Albert Hall concert aired on PBS in March.